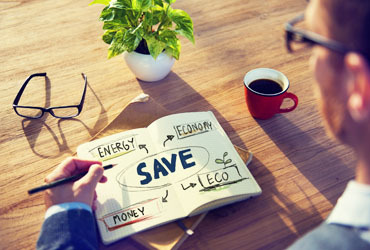 In celebration of World Environment Day we have put together a quick guide on how you can help to save the planet and reduce your energy bills too! Our utilities contribute to climate change, so by looking at ways to reduce our energy consumption we can all help to reduce the effects of global warming and save money at the same time! When the temperature of the earth increases water reserves can dry up, so it is important to conserve water where we can. This can be achieved by reducing the amount of water we use in our homes and by recycling water too! There are many nifty solutions available from toilets that flush recycled water from your taps, to water butts in the garden which preserve excess rainwater that can be used to water your garden or clean the car during droughts. And on a daily basis there are even more simple solutions like using the shower instead of the bath, as much less water is used. It is all too easy nowadays to simply turn the thermostat up to boost the heat supplies within our homes, but it is important to make a conscious effort to monitor your energy usage. For example, try turning the heating down a little when your house is unoccupied and improve insulation by resealing exterior doors and windows and using draft excluders and door seals to prevent heat from escaping your home. If you think you may need to turn the heating up just a little, consider wearing a jumper or sitting with a blanket rather than simply turning up the thermometer. The steep increase in household electronic devices is having a significant effect on the environment so it is important to try and reduce our usage. You can do this quite simply by switching devices off rather than putting them on standby when you have finished using them. Lighting in particular proves a significant drain on fossil fuels and also contributes to our greenhouse gasses. Try opening curtains and blinds and turning the lights off when you are leaving an empty room. For more inspiration, why not read our previous blogs Key Boiler Checks You Should Make and 6 Ways to Keep Your Home Cool.